Posted on November 1, 2018 at 6:27 pm. Congresswoman Elizabeth Holtzman of New York served on the House Judiciary Committee that investigated the role of President Richard M. Nixon in the Watergate scandal and voted to impeach him. Now, in an excerpt from her book, The Case for Impeaching Trump, Congresswoman Holtzman draws connections between the Nixon Administration and the current administration, laying out a clear case for launching impeachment investigations against Donald Trump. In her excerpt for Salon, Congresswoman Holtzman details the many constitutional violations Trump has perpetrated. These include obstruction of justice and violation of the emoluments clause, among many others. They demanded that Congress take action, and it did. 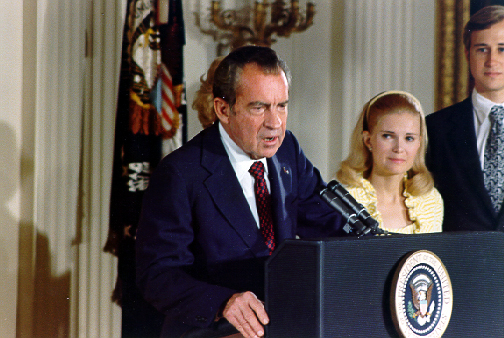 It started an inquiry, which resulted in a bipartisan vote for articles of impeachment, forcing Nixon to resign. It was in response to obstruction that the articles of impeachment against Nixon were adopted. Their message? Presidents cannot block, tamper with, and destroy the machinery of justice that is aimed at them. If they do, it is at their peril. They face impeachment, removal from office, even imprisonment. But if we allow presidents to block, tamper with, and destroy the machinery of justice that is aimed at them, we do so at our peril. The rule of law will go up in smoke. We will enshrine two standards of justice, one for the powerful and one for everyone else. We will find ourselves on the road to tyranny. Congresswoman Holtzman is right. Much like Nixon, Trump has violated the Constitution repeatedly. It is time for Congress to take action – just as it has before in similar circumstances – to launch an impeachment investigation. We must act to preserve a just system that serves everyone, not just the powerful. Together, President Trump’s actions are indicative of a president who has established a different standard of justice for himself—exactly the kind that we declared impermissible in Nixon’s articles of impeachment. He has done so at the expense of democracy. And he’s done so at his own peril. The American people demanded justice during the Nixon Administration and we demand justice now. Read the excerpt from Congresswoman Holztman’s book in Salon here.